* General consensus is held among experts on baboon forms, but with broad disagreement over division of species within the genus. Widespread and abundant. No major range-wide threats. Locomotion: Walks with four limbs. Gait swaggering. Runs as if galloping. Social Groups: Highly organized social units; 3 primary levels: troops (c.100) containing several bands (30-90 individuals) comprised of many one-male units (OMU's). Most interactions are between the male leader of an OMU, females within the "harem" and their offspring. Diet: Primarily vegetarian; consume seeds, roots, berries, leaves, and flowers. Raid agricultural lands. Opportunistically take insects and occasionally prey on hare or dik-dik antelope. Predators: Humans and domestic dogs; potentially lion, leopards, hyenas, jackals, and cheetah. © 2014 San Diego Zoo Global. Updated October 2014. 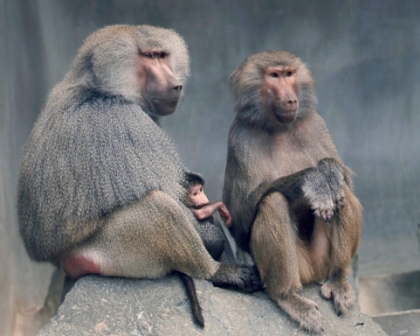 How to cite: Hamadryas Baboon (Papio hamadryas) Fact Sheet. c2014. San Diego (CA): San Diego Zoo Global; [accessed YYYY Mmm dd]. http://ielc.libguides.com/sdzg/ factsheets/hamadryasbaboon.